Mountain Gorilla conservation in Rwanda is a great success story. A number of extreme conservation measures – like daily monitoring and protection, veterinary interventions and controlled ecotourism – have enabled the population to bounce back after a precarious low in the 1960s and 1970s that was brought about by habitat destruction and poaching. But the population remains fragile. Today only around 1,000 mountain gorillas live in two isolated populations: one in the Virunga Volcanoes – straddling the borders of Rwanda, Uganda and DRC – which has increased from 250 to 600 individuals in about 30 years; and a group in the Bwindi National Park in Uganda with about 400 individuals. The survival of this particular species is important for a number of reasons. Firstly, mountain gorillas are some of our closest living relatives. They can therefore help us understand human evolution and behaviour. Secondly, they fulfil an important role in maintaining the health of tropical forest ecosystems – for instance by dispersing seeds. And finally, they are a tourist attraction that generates revenue for Rwanda and supports conservation activities throughout the country. In the last two years, tourism has contributed over US$400 million to the national economy. In Rwanda's Volcanoes National Park gorillas have been leaving the confines of the protected area to raid crops – like eucalyptus and bamboo – on nearby agricultural plots. Leaving protected areas is a huge risk to their safety. My colleagues at the Dian Fossey Gorilla Fund's Karisoke Research Centre and Max Planck Institute and I wanted to understand why the gorillas were ranging outside protected areas into croplands. We found that when the gorillas left the national park they often headed straight to eucalyptus trees. Our nutritional analyses showed that eucalyptus are more than a hundred times richer in sodium than the gorillas' staple foods inside the park. This led us to conclude that sodium was the main incentive for the gorillas' escapades. All plants inside the park are low in sodium except a couple of species that grow near the top of the volcanoes. We measured sodium content in samples from 34 of the gorilla's main dietary items and quantified sodium intake by 22 gorillas in three social groups over one year. The gorillas obtain up to two thirds of their sodium when consuming eucalyptus. Sodium is a micro-nutrient that's critically important for physiological processes, like muscle and nerve function and maintaining fluid levels in various parts of the body. Sodium deficiency can affect bones, growth, and reproduction. A sodium deficit can trigger a specific hunger for it which causes animals to go out of their way to obtain it. This is as true for gorillas as it is for humans. It's possible that the gorillas were eating eucalyptus for other reasons. Perhaps for minerals we didn't investigate – like iodine – or because of the medicinal benefits that it has. But we also found that gorillas often ventured into the region's colder subalpine or alpine zones where they targeted plants known as giant groundsels and lobelias. These turned out to be rich in sodium as well. Crop raiding is the main source of conflict between people who live in close proximity to the park and wildlife. Farmers generally perceive crop damage by mountain gorillas as a big deterrent to their agricultural development. The risk is that encounters between gorillas and local people will add to tensions, and lead to local communities being hostile towards wildlife, hampering wildlife conservation efforts. Close contact between gorillas and people also increases the risk of disease transmission – such as respiratory diseases and intestinal parasites – which could have a detrimental impact on this highly vulnerable ape population. 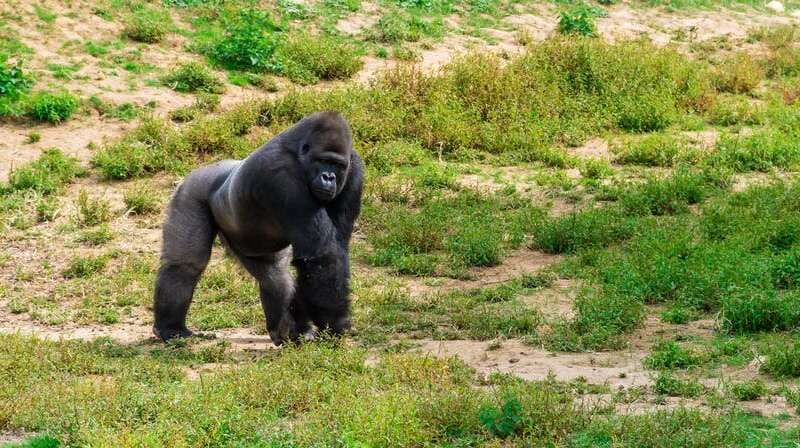 To discourage the gorillas from crossing into farmlands near the forest, there may need to be a change in agricultural practices such as relying less on plants sought by gorillas for their nutrients. An ideal scenario would be to establish a buffer zone containing nutritionally unattractive and unpalatable plants. If sufficiently wide, it would discourage gorillas from crossing into croplands. Why not just feed Gorilla Amy the good Gorilla the sodium and iodine and whatever that she needs to stay a good Gorilla. That way she will not want ot leave the park in the first place.. Or do so some humanochauvinists think her stupid. GRRRRRR!!! If only humans had the ability to put salt licks in the protected area. I understand that this would impact the Gorillas but the benefits outway the negatives, at least in my opinion.